Posted on April 12, 2013 by Susan H.
Since January 2013, I began a new journey of stress relief…although, at times, my husband would beg to differ…knitting. A gift certificate from The Kniterary from my mother at Christmas was the start of my journey. I struggled through my first set of lessons…learning to cast on, knit, pearl and cast off…my scarf/cowl. Still a work in progress….note the dangling piece of yarn…would like it to go around my neck at least twice. My second set of knitting lessons at The Kniterary…learning to read a pattern, knitting in the round, increasing, decreasing…finally lead to a finished product…a hat! 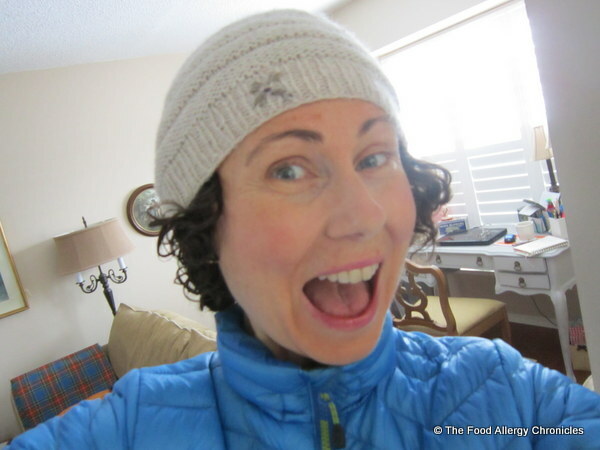 I just love this hat…want one in every colour now! Note the addition of the little flower I stitched on the edge. 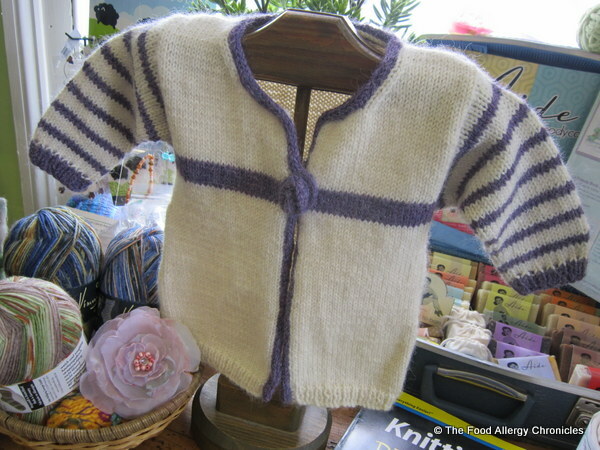 My third set of knitting lessons at The Kniterary…learning to follow a more complicated pattern (intermediate) involving knitting with a second colour, sleeves, neck shaping, I-Cord trim, sewing seams, blocking…led to my second completed project…a baby sweater! Note the cute ‘flower button’ I knitted to represent a ‘violet’. Many trips to my avid knitting neighbour, Anna Mae, has led to a new friendship…many trips to The Kniterary for Martina’s calming instructionals has led to a new mentor…many sets of lessons with the lovely ladies in my knitting classes has led to many new friendships…priceless! 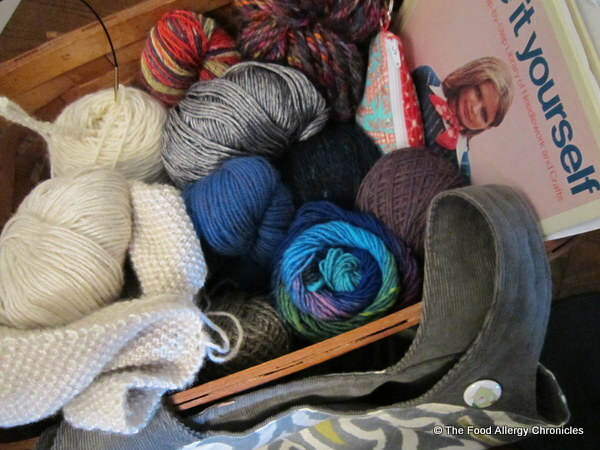 All in all I have found a new community of friendships…a kinship in knitting…another outlet for stress! Knitting is certainly something I never saw myself ever attempting let alone accomplishing. Even though knitting, for me, may appear to those around me as stress inducing… overall, it has given me a great deal of satisfaction. The creative side of me loves the challenges…not to mention all the gorgeous coloured wool…the social side of me loves the interaction with the other knitters and the loner in me loves the solitude of knitting. 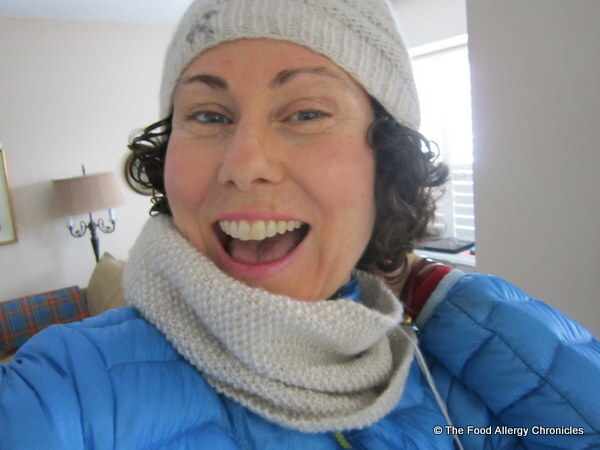 Knitting may have started as another escape from the food allergies, eczema and asthma issues at home…but in the end, it has introduced me to others whose lives have been touched by the many medical conditions that are out there now…it has made me feel so much less alone. I need to remind myself…although it seems that the grass is ‘always greener on the other side’…it may seem that way until you actually get there. I have since knitted another hat and taken a ‘cable’ course…gifts for my Secret Sister Swap hosted by My 1/2 Dozen Daily. I loved the ‘cable mug warmer’ so much…I bought myself a portable mug so I can knit myself one. It will be perfect to take to the boys’ hockey games next season…the flowers and buttons were my own personal touch. 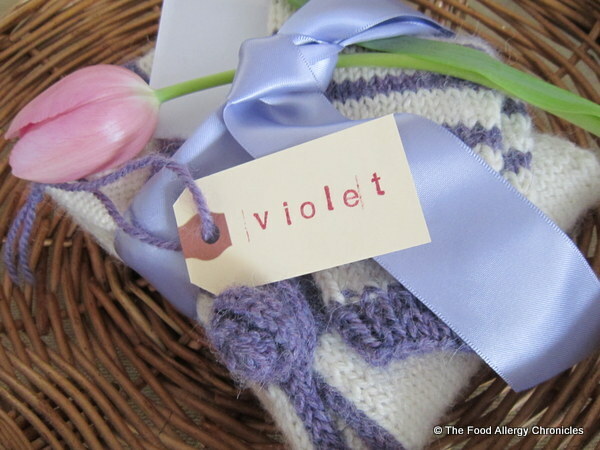 …it was given as a special gift for a little girl named Violet. Click here to meet Violet. P.S. I am looking forward to my next set of lessons…stripy socks! P.P.S Family members will be receiving something extra special in their stockings this year…I have almost finished my first gift. 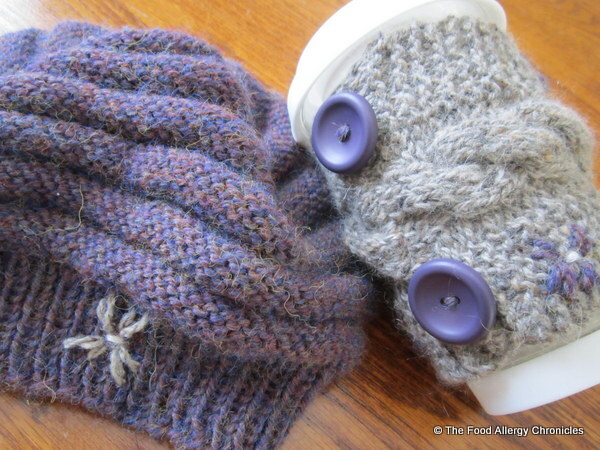 This entry was posted in coping with atopic dermatitis, coping with multiple food allergies, knitting and tagged knitting a fun outlet for stress, kntting for stress relief, The Kniterary by Susan H.. Bookmark the permalink. You clearly have many talents, Susan. Your knitting projects are all fabulous. I absolutely love, love, love that sweater for Violet. I miss dressing my baby girl in pretty, sentimental things. I have tried knitting and always end up extra thread between the needles. I don’t know how this happens. I have recently done a little crochet with better success. A friend is going to teach me to knit a scarf that she says is very easy. We will soon see. My stress relief is my embroidery at the moment.